many 3d Imperial ships around. like the little barbarians that you know you are! I found the Download button! YAY! One question: Is it possible to shorten the name of the ZIP file? My computer has a limit it imposes on the amount of characters in the address something occupies on my hard drive. The address includes the entire folder hierarchy. I would like to download this one, but I don't see that option here. I'll try the other link. Apparently it is no longer available at ShareCG. They would have dropped the ENT MU decorations by the time TOS came around. 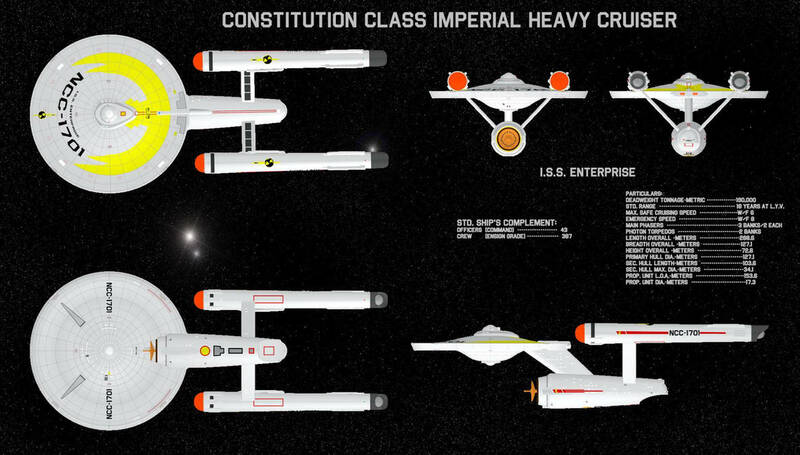 Looking forward to the non-imperial Connie. This is a neat tease. One little suggestion though. Can the shuttlebay doors be made as a separate material? So they can be made invisible to look open and a shuttlebay shoved in. Actually, what I'm planning to do, is three different door. Closed, halfway open, and fully open. I'd like to rig them to open and close, but that IS far beyond me at the moment. A question: Do you have materials/objects for a Starfleet version? Port, Starboard, Dorsal, and Ventral Warp Nacelles. Connie Warp Pylons, the shorter Warp Pylons from the Transport/Tug. Connie Dorsal, Destroyer/Scout Dorsal/Warp Pylon. 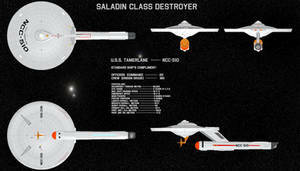 Registry Markings for Destroyer/Scout; Saladin and Tamerlane in USS format. Man, these are awesome. I hope I can import them to Max. will have trouble with it. and one registry for it, USS Ptolemy. 1. does it have a texture, or are all the letters and markins material zones? 2. 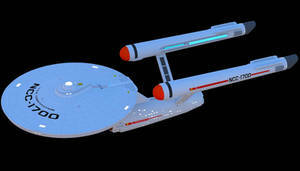 Do the warp nacelles have this uncharacteristic glow people like to add? From the graphic, it looks good. No textures. The markings are material zones, the registries and Empire markings are modeled. Eh, I can turn off the glow in DAZ|Studio, so it's not important. Was just curious. The only bad thing about a ship with no textures is that it's only ONE ship. ONE Starship of a dozen. And I'd rather like to make markings for my own Starship, but no model I ever encountered was simple enough that I could break it down in Wings3D and add my own markings.